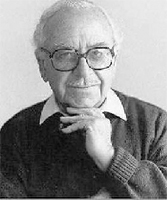 Wolfie Kodesh was born in Benoni on 18 October 1918. His paternal grandparents arrived in South Africa after fleeing the pogroms in Eastern Europe. His mother, Fanny Shapiro, came from East End in London. Kodesh’s father ran a hansom cab business which collapsed during the great depression of the 1930s. After his parents separated, Wolfie, his twin sister and brother moved to Cape Town where they joined their mother. His family was relatively poor, and his mother opened a shop in the Woodstock slum, an area where the family lived. Thus, Kodesh, early in his life, became acquainted with poverty and non racialism, as communities of different racial groups lived in the area of Woodstock and District 6. Kodesh went to Villiersdorp where he became an ardent rugby player. Kodesh’s politicisation began in the 1930s when his sister found work as typist for Communist Party of South Africa (CPSA) General Secretary, Moses Kotane. In addition, the conditions under which he grew drove him towards a life of political activism. He then joined the CPSA and began selling the Guardian, a leftist newspaper sympathetic to the CPSA, around the streets of Boo-Kaap, Woodstock and District Six. After the outbreak of World War II, Kodesh joined the Union Defence Force and was deployed in Ethiopia, Libya and Italy. As war raged, conditions for soldiers deteriorated particularly for black soldiers and Kodesh took up their cause and demanded equal pay for them. Consequently, he was arrested, detained and charged with instigating mutiny. Charges were later dropped by the authorities. Kodesh returned to South Africa after the war and took up fulltime work for the CPSA in 1947. He wrote for the Guardian exposing the poor and appalling conditions in Cape Town’s slums while also selling the newspaper to earn a living. In 1950, two years after the Apartheid government came to power, the CPSA was banned under the Suppression of Communism Act. Kodesh was served with a banning order which prevented him from working as a journalist. He defied his ban by continuing to publish atrocities of the apartheid government. For instance, he worked with Ruth First to expose the appalling condition of black workers in the potato farms in the Eastern Transvaal (now Mpumalanga). Together with First, they also wrote an exposé of the Afrikaner secret society, the Broederbond. When the Guardian was banned, it was re-launched as the New Age and Kodeshserved as one of the directors for the new publication. In 1963 Kodesh was arrested and detained without trial in solitary confinement for 90 days under the 90 Day Detention Law. Later that year, he was illegally deported by the Apartheid government to the United Kingdom (UK). While he was abroad he worked for the ANC until he was deployed to work in uMkhonto weSizwe camps. He later became in charge of logistics in Lusaka, Zambia. During the 1970s, especially after scores of students arrived to join MK after the 1976 Student revolt, Kodesh was tasked with addressing material needs for the young cadres. After the unbanning of the ANC by the National Party (NP) government, Kodesh briefly returned to South Africa in 1990but left soon after. He eventually returned to Cape Town in 1991. Between 1992 and 1995, Kodesh worked on collecting stories of South African political activists which are housed at the Robben Island Mayibuye Archives at the University of the Western Cape. Kodesh passed away on 18 October 2002 in Cape Town.